Leading cash & carry group uses digitalsignage.NET to communicate with clients across its three depots across the Midlands, UK. The brand is well known for its varied range of ethnic products stocked up by more than 70% of Asian owned independent retail food stores throughout the UK. The latest install took place in East End Foods’ £10m outlet at Aston Cross- Birmingham, which is intended to become the brand’s flagship store. 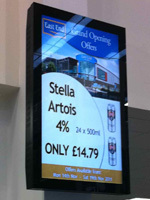 digitalsignage.NET powers digital posters located at checkout points and across the depot that show adverts of products and special offers. The entire network that counts 13 displays is supported entirely by third party advertising. Using digitalsignage.NET, East End Foods’ headquarters are able to control the network remotely and monitor the system’s performance from their offices, ensuring that the adverts played at the right time, on the right screen, in the right location. The reporting section within digitalsignage.NET enables East End Foods to present its advertisers a reliable proof of performance. The installation work was carried out by our partner and VAR- Chamber TV, a leading AV company with an extensive experience in delivering customised digital communication solutions to colleges and businesses across the UK. 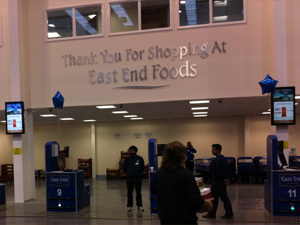 Having used the system for 3 years and being convinced of its utility in a retail environment, East End Foods envisages stocking and reselling digital displays powered by digitalsignage.NET. If this happens, then these will be the first non-food items ever sold by the cash & carry brand. This entry was posted in and tagged advertising, digital signage, Digital signage retail, digital signage software, retail digital signage by Dynamax. Bookmark the permalink.